Heat oven to 325°F. Spray shallow roasting pan or 15x10x1-inch pan with cooking spray. Place ham, fat side up, on rack in pan. Score outside of ham in diamond pattern. Insert ovenproof meat thermometer in thickest part of ham. Bake 1 hour. In small bowl, stir together orange marmalade, mustard and bourbon. Brush half of mixture evenly over ham. Bake 30 minutes longer. Brush with remaining mixture. Bake 30 to 45 minutes longer or until thermometer reads 140°F. If pan drippings start to burn, add up to 1/2 cup water to pan. Remove ham from oven; cover with foil, and let stand 10 to 15 minutes for easier carving. Slice thin. 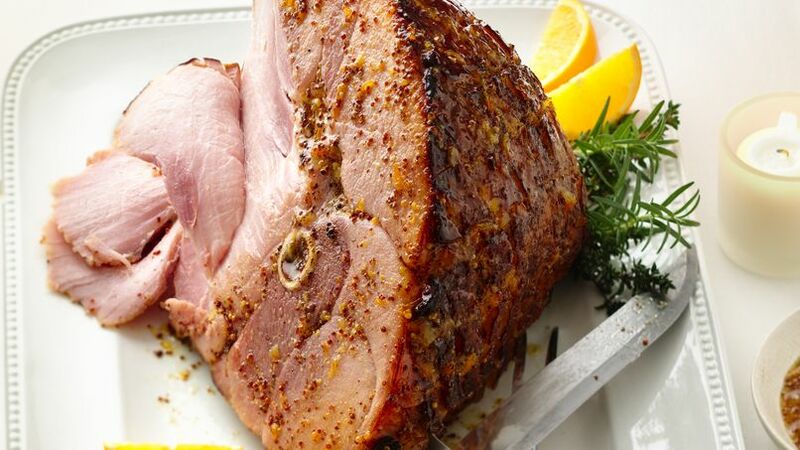 Enjoy your dinner with his ham glazed with orange and bourbon.